L to R, Front row: Bill Madsen, Butch Polan, Bill Jordan, Dwayne Fussell, Farrel Culpepper, Charles Shafer, Larry Newman, James Griffin, Ralph Myers. Second row: Doug Gilbert, Tommy Wolters, Joe Carroll, Ross Spencer, Richard Fussell, Thad Smith, Albert Voight, Paul Short, Vincent Perez. Top row: Warren Walding, Lynn Sturm, Stanley McDonald, Charles Peck, Roy Wiesner, Jerry Goynes, Alfred Peck, Lenny Steffans, Volan Youngblood. The sporting world may have seen larger celebrations but never one as colorful or as jubilant as staged by Katy High School students and fans on the turf of Brownwood High Stadium last Saturday afternoon. The Fighting Katy Tiger subdued the favored Sundown Roughnecks 16 – 6 to become State Champions. It was a sweet victory for a Tiger squad that has worked hard since mid-August and a host of friends that have followed the Tigers for fifteen in their quest for the coveted championship. It was a beautiful afternoon for this State Championship game and the sun brought out the color of red hats, dresses, shirts, ties, and coats standard wearing apparel for Tiger fans, as they throng the field to congratulate a tired but happy Tiger squad that had just won themselves a State Championship over a west Texas powerhouse. It gave the Tigers twenty straight wins, fifteen this season, and a two-year mark of twenty-four wins of twenty-five games played. This championship battle was a terrific climax to a season that saw the combined efforts of players, coaches, students and fans reap rich dividends. To the players it seemed almost to good to be true, and they could hardly realize the full impact of their success until they rolled into Katy to find a banner stretched across highway 90 that said "Welcome Home, Champs!" A large number of former Tiger stars were on hand for this title game to watch their former teammates reach the goal which they had helped lay the groundwork in years past. The game got off to a roaring start when McInturiff of Sundown returned the opening kickoff to the Tiger 30 yard line before being pulled down by Shafer. The Tiger defense dug in to stop the Roughnecks on the seven from where they attempted a field goal which was unsuccessful. The Tigers put the ball in play on the 20 yard line and never gave up possession until Fussell sent Jordan around the left end on a pitchout from the seven for the first score of the game. The identical play gave the Tigers two extra points and an 8-0 lead. The Tigers dominated play in the first half as they intercepted one pass and recovered two fumbles to keep the Roughnecks back against the wall. The lone Roughneck touchdown came late in the second quarter on a sixty yard pass play. The try for extra point was no good and the half ended 8-6. The big play of the game came on the second half kick off when Shafer picked up the kickoff on the 18 yard line and threaded his way behind good blocking for 82 yards and a touchdown. Culpepper blasted off tackle for the extra points to put the Tigers up front 16-6. Both teams threatened during the remainder of the game but neither was able to push across a score. The Tigers had the deepest penetration by moving to the four yard line late in the third quarter but were unable to score. The game ended with Tigers in possession on their own forty yard line. It was a great overall effort by the Tigers with particular praise going to the defense lineup of McDonald, Culpepper, Wiesner, Sturm, Smith, Peck, Wolters, Fussell, Carroll, Newman, Jordan, and Shafer. This defensive crew held the Roughnecks to one touchdown, and that on a pass play, despite the fact the Roughnecks had averaged better than forty points per game this season. Offensively Fussell, Voight and Steffens moved in for Sturm, Wolters, and Newman. This line up showed their ability by going 109 yards on the ground for the first touch down against a tough Roughneck defense. 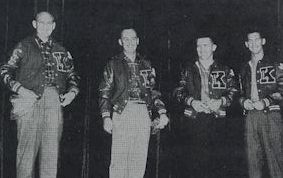 Others who saw service in the game were Griffin, Madsen, Youngblood, and Gilbert. Seniors playing their last game for the big red were: Center, Thad Smith, Gaurds, Richard Fussell, Joe Carroll, and Vincent Perez, Tackle, Charles Peck and Backs, Charlie Shafer, Bill Jordan, Farriel Culpepper and Dwayne Fussell. It was a great day for these Senior linemen because they knew they had been part of a great Tiger line that again had shackled an opponent and had carved out running room for a back field combination of Fussell, Culpepper, Shafer and Jordan, perhaps the most balanced foursome in the state, to roll up sixteen points in Katy's first state championship.